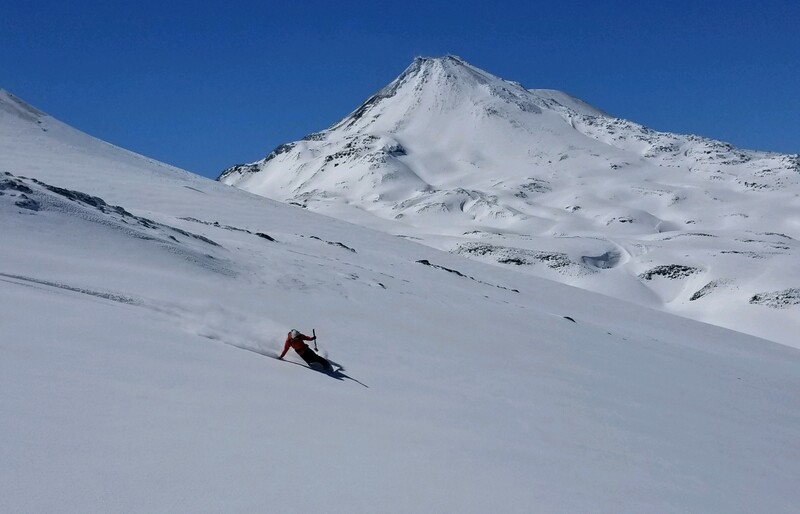 This trip is a unique splitboard and ski touring adventure exploring the best of the Chilean volcanoes. With a mix of ruggedness, exoticness and wonderful Chilean hospitality this trip is like no other. We will begin our trip in Northern Patagonia’s beautiful Lake District sampling some fine turns before travelling around in search of prime South American volcano lines. A huge highlight is the horse assisted ski tour on Volcan Puyehue. We travel on horses from the lush green forests to a backcountry hut, then ascend on skis or splitboards to the summit of Punta Alaska where we will have a chance to rip big Alaska like lines into the crater of the volcano. Join us this September for exceptional off-season shredding. This trip is truly volcano hopping at its finest so pack a light bag and jump in the van, it’s go time!!! 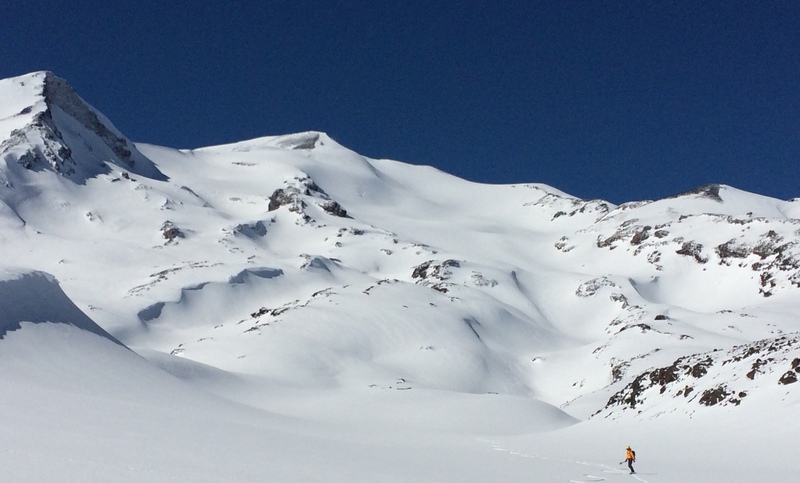 Our Chilean ski tour objectives range from Volcanoes in the Southern Lakes District to the Volcanoes of the Central Andes. We try and climb/ski 4-5 volcanoes during our time together. We have learned its better to be flexible with the changing weather conditions of the Andes as your guide will inform you on objectives prior to the trip. These summits are located at manageable altitudes so the experience is enjoyable…and no days are lost to acclimatizing. The touring varies from epic full days to mellow 5-6 hour adventures. The phenomonal ski conditions that these volcanoes can offer are legendary. 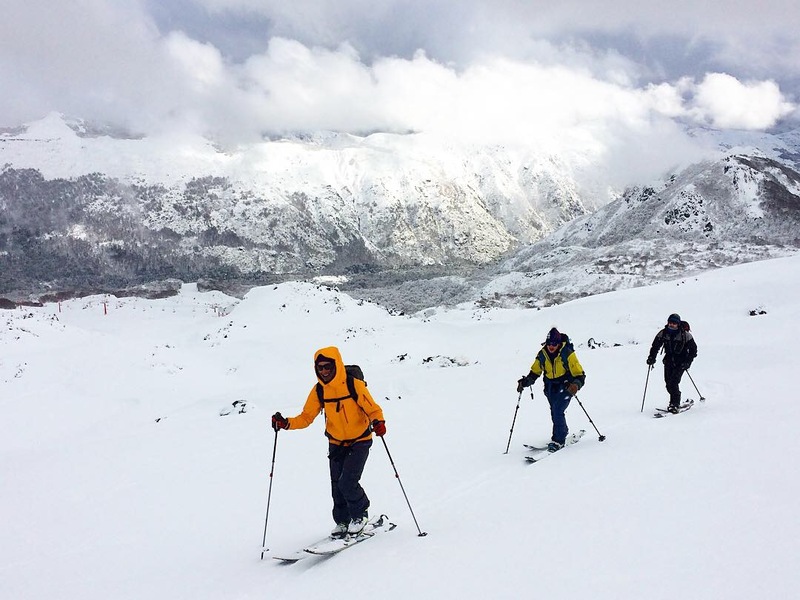 Come experience a September session in Chile as we go on this amazing ski adventure, most often finishing our day with a visit to the local hot springs. What more can you ask for! We stay in very comfortable cabanas and refugio’s dining on the local cuisine which includes the most delicious fresh seafood, grass fed steaks and vegetarian meals. From the private hot tub on your deck to the great Chilean cuisine, incredible wines and amazing ski touring that have made this region of Chile popular, this trip is one not to be missed! Travel is relatively easy with an overnight flight to Santiago, Chile, followed by a short hopper flight to the city of Osorno in the heart of the Lake District, where we will be there to start your adventure with you! SKILL & EXPERIENCE LEVEL: Advanced level skiers and snowboarders with some previous backcountry experience. 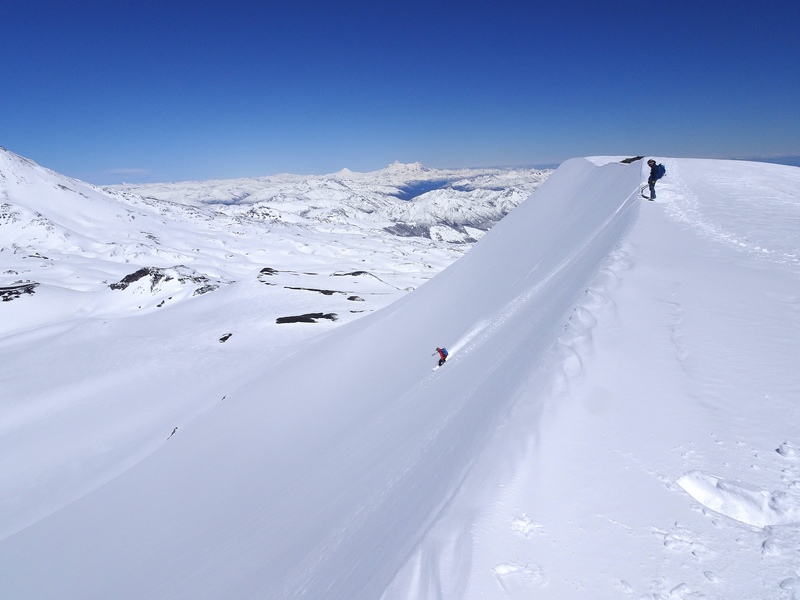 For the Chilean ski tour, you should be comfortable riding black diamond runs at a resort in most any conditions. Very good physical condition required. INCLUDES: This trip is all inclusive which includes lodging, hotspring fees, international breakfast and all dinners. Every meal is provided on the overnight tours too. We provide only the best avalanche safety equipment to our guest. 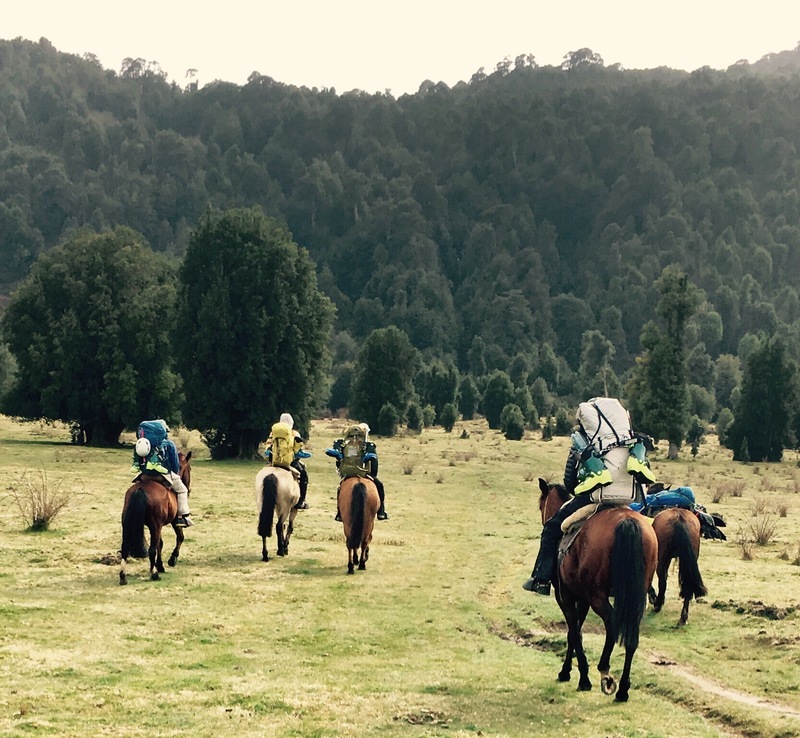 We also provide all in-country private ground transportation and private chauffer, mules/horses, local logistics and AMGA certified ski guides for your 10 day adventure. 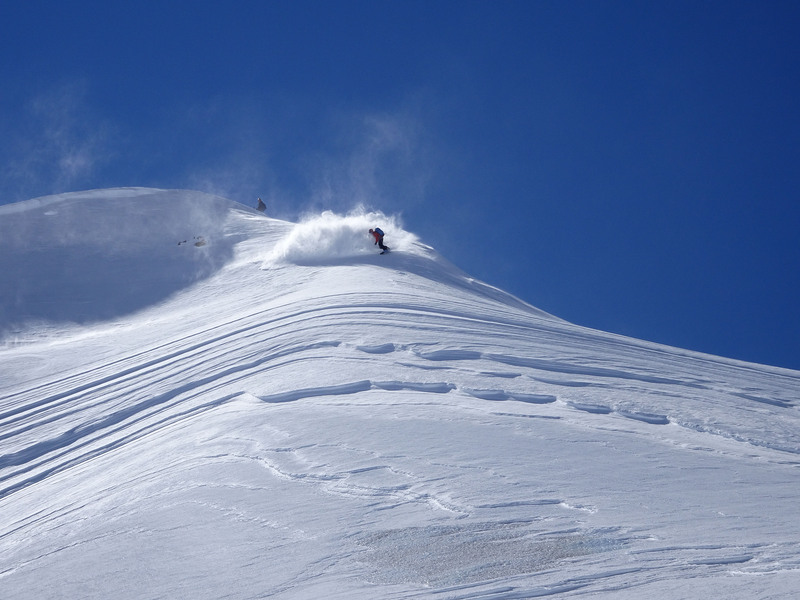 We can customize any length trip to fit your schedule, contact us today to book your Chilean ski trip!